I have a real addiction, and I am not afraid to admit it. I sneak peanut butter into just about every recipe I can! We love dressing up a regular boxed brownie mix, it makes baking so much easier. We partnered with Peter Pan® to bring you these delicious Peanut Butter Cheesecake Brownies. Trust me, they are as delicious as they are pretty! Preheat oven to 350 degrees, and grease a 9x13 baking pan. Prepare brownie mix as directed on the box. Pour brownies into greased 9x13 pan. In a separate bowl, beat together eggs, cream cheese, butter, and vanilla. Once smooth, slowly beat in peanut butter until combined. Spoon peanut butter mixture over brownie batter. Don't spread it around, just kind of glop it on top! 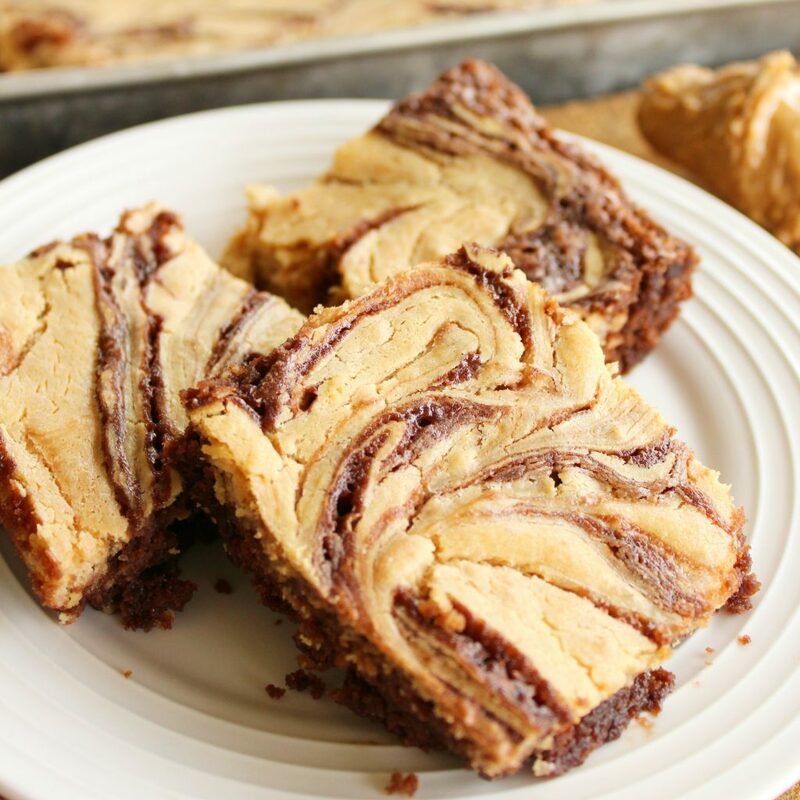 Using a butter knife, swirl your peanut butter mixture into your brownies by slowly moving the knife back and forth, making sure to spread the mixture to each edge of the pan. 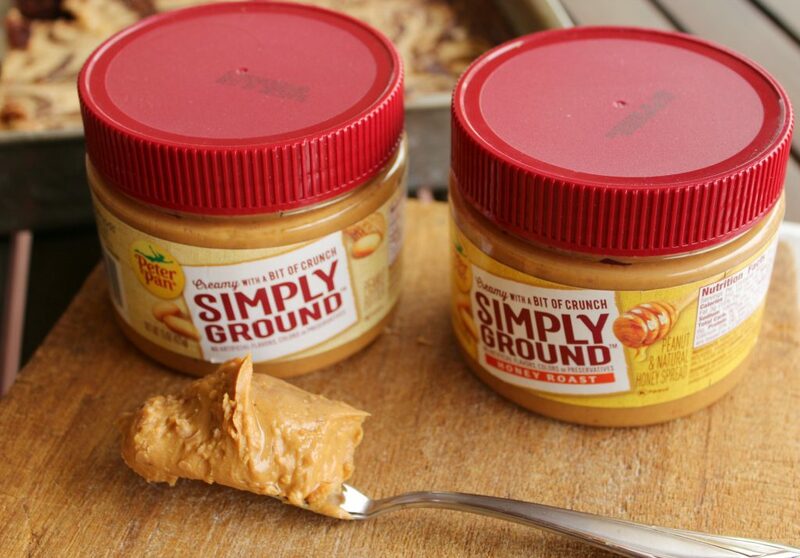 If you haven’t tried the Peter Pan Simply Ground peanut butter yet, we would highly recommend it! It has a delicious creamy texture with just the right amount of crunch. We love it in just about everything, especially with our favorite brownies. If you’re feeling really adventurous, these brownies are even better with Peter Pan Simply Ground Honey Roasted peanut butter. The same great texture but an even sweeter taste. I’m afraid I did not have enough of my Honey Roasted peanut butter left to add to these brownies, since I had eaten most of it with a spoon after sampling it just once. 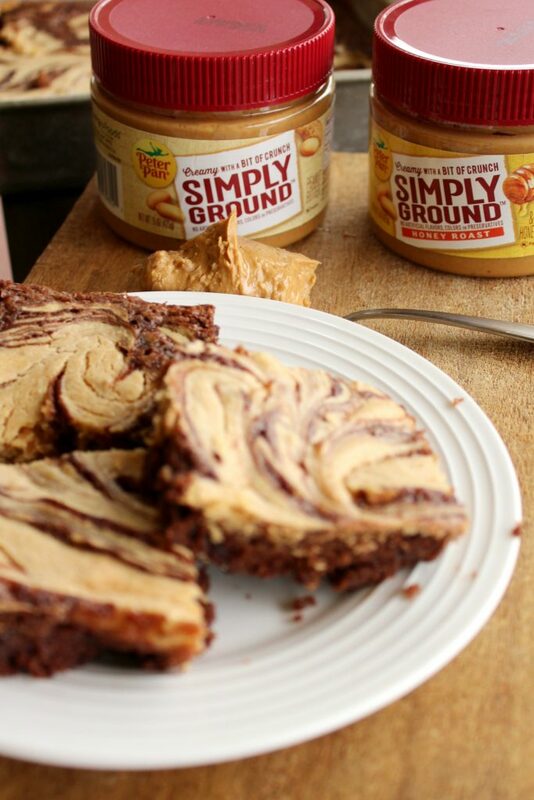 You really can’t go wrong with a good brownie, some cream cheese, and a whole lot of peanut butter! I made these brownies tonight to take to a friend's house. I really like the fact that there is no added sugar in the cheesecake part of the recipe. The brownie provides plenty of sweetness. I did add some chopped peanut butter cups to the cheesecake batter. I will definitely make these again! Do you serve these warm or do you chill them first? Hi Chelsea, we like them both ways. But usually at room temp or slightly chilled. (Only because I like my cheesecake cold). But whatever your preference is. It is delicious warm or cold.